Up to 108 Mbps via 802.11g wireless networking. 4-port Ethernet switch for wired connections. Wireless networking is constantly evolving, and the need for increasingly faster speeds and greater range is not only sought after, but expected. If better wireless speed and range with consistent wireless connections is what you're looking for, then NETGEAR has you covered with the WGT624 Super-G Wireless Router. With this handy device you'll have no more dropped connections, and you can kiss dead spots goodbye. With Super-G networking, the WGT624 can deliver speeds up to 108 Mbps. View larger. This compact, stylish router provides a simple and secure way to share your high-speed Internet connection. The WGT624 has a 4-port switch, and delivers twice the speed and four times the coverage of the standard Wireless-G protocol. And to achieve maximum performance, NETGEAR suggests using Super-G wireless adapters, such as the Super-G Wireless PC Card, Super-G Wireless PCI Adapter, or the Super-G Wireless USB 2.0 Adapter. If security is a concern, you can rest easy knowing that your network is being powered by this router. Designed to be configurable for private networks or public hotspots, the WGT624 features double Firewall protection to defend your computer from external hacker attacks. And with Touchless Wi-Fi Security, this device makes securing your network a breeze. Setup is made quick and easy with the Smart Wizard install software. System requirements include a broadband (cable or DSL) Internet Service and a modem with an Ethernet connection; 2.4 GHz wireless adapter or Ethernet adapter and cable for each computer; Microsoft Windows Vista, XP, 2000, NT, Me, 98, 95, or other operating systems running a TCP/IP network; and Microsoft Internet Explorer 5.0 or higher, Netscape 4.7 or higher, or Firefox 1.0 or higher, and Safari for Mac. Microsoft Vista Beta drivers are available at www.netgear.com/vista. NETGEAR WGT624 Super-G Wireless Router, setup CD, power adapter, Ethernet cable, vertical stand, setup guide, and warranty/support information card. I had a few issues setting this router up and in the end had to sell it. Customer support conveniently got "disconnected" after we began our conversation.. twice. Just to make it clear, I am extremely polite and patient on the phone, and I've never had a call drop out... they disconnected. I would say at the very least they should have called me back, seeing as I had just given my phone number to him. The quality of Netgear products is no match for the pathetic quality of their technical service. After a long phone hold you can expect the tech to be inattentive, rude and unable to hear you because of the poor phone lines and noise of other techs talking in the background. You get the feeling they're only half there and some of their answers are not even that. Double check everything they say because they will leave out critical steps. Garbage - Netgear, you blew it! You lost my vote. If there was ever a product that should "earn" zero stars in this rating system, wow, do we ever have a winner. I wasted far too many life-minutes of my time troubleshooting this product. I'll never buy Netgear again. I've switched to the Linksys-Cisco WRT54GL and I'm not looking back. I haven't had to reboot this box in six weeks so far!! Hey that beats Netgear's record by six weeks already!!! This Netgear required constant rebooting. I experienced dropped VoIP calls, lost my connection with all three laptops sporadically throughout the day. A dozen router reboots wasn't uncommon. I yelled at my ISP, my VoIP provider etc. read the forums and even bought a second one of these pieces of garbage just to make sure. Well, I'm sure. Faulty design must be the culprit. What a piece of garbage!!!!!!! Excellent - very fast service. I would recommend this seller highly. This is a nice router and runs well. I gave it 4 stars as it drops the connection once in a while and reconnects in a couple seconds. You won't really notice this unless you are downloading something. I had a WGT614 and i was almost happy with it, however i was looking for more range. This router will give you some 5% more coverage at the expense of stop working every two hours ore so. Even with low traffic. The only solution is to reboot it. Which means i have to stop whatever i'm doing, go downstairs (three floors), open two locked dors, reboot the thing, and then go back to work. The net is full of complaints about this router. And no solutions. I should have known better. And Netgear should withdraw this product from the market for the bad rep is giving them. It crashes and locks up. Only work around is rebooting the router. This product is pretty good when it works. Unfortunately that is not often enough to get it a good rating. I am a computer engineer by trade and I know how to run a network. The NetGear WGT624 is a piece of junk. If you plan on using the wireless connectivity you better leave the router where you can get to it easily as you will be rebooting it frequently. If you google up WGT624 and CRASH you will see what I mean. Also note that the amazon ratings show more one star reviews than all the good review combined. That is unusually bad for an Amazon score. This router crashes, Netgear has known about it for over a year and they do NOTHING. Not only do I hate this router, but I doubt I will by Netgear again. This is an inexpensive wireless router with many of the features you would expect -- support for encryption, an opt-in MAC address list to screen out freeloader neighbors, child protection features to protect your kids from unwanted content, and a decent firewall to keep the older "kids" out. I found the advanced settings hard to configure. Netgear seems to be so bent on making the setup process simple that more sophisticated features like "I want certain services to be let through the firewall" are hard to find and even harder to configure. ...but in the end I got it working. The real reason for giving it 2 stars was its poor longevity. A home router usually lasts me about 2-3 years. In fact, I gave up my last router not because of hardware failure but because it wasn't able to defend itself against a newer DoS attack. I bought this new in May 2008. When I changed a setting in February 2009 it stopped remembering my settings, and thereafter would only operate with factory default settings (so it couldn't remember things like the PPPoE login and password). Works well with dual boot Intel Macbook. I bought this router the day before I received my new Gateway NX570X laptop. It installed beautifully within 30 minutes and both my desktop and laptop connected to the internet. Beautiful, but I have still not been able to share any resources between the two PC's. Any comments/suggestions most welcomed! I bought this from Amazon as a refurbished model. It works great, was very easy to set up, never loses the connection or sends out a weak signal. The only reason I give it four stars is that the instructions that come with the refurbished model are awful barebones; I had to go online to get the model before I could figure out how to install it. When this unit works it works well. The problem is it constantly needs to be unplugged and plugged in as it drops the internet connection about twice a day. I have version 3 and the latest firmware. I can't believe Netgear hasn't fixed this problem yet or has taken this defective product off the market. Maybe there needs to be a class action law suit to wake them up? I have the DG834GT Netgear modem router but I wanted to make a wireless network in my basement lab.So I needed a wireless switch. I didn't have much money to spear (because access points costs twice as this one I took it 25 euro) and I saw this router as an Offer in an Internet store.When I got it and plugged it I was very satisfied with its piece of cake adjustments and plug and play capability. First I took a LAN cable From My Home to the basement and plugged into the router.So now I had two routers in the same network.Surprisingly there weren't any conflicts and the basement pc worked just perfect connecting to the intrnet but I was using a different set of IPs from the Primary router and I couldn't tranfer Files to another computer attached direct to the Primary's router network and I did the following Steps and had it work perfect. You'll have them work together perfectly. I've always used Netgear routers and I'm always happy with them. Including THIS one. This is my 3rd Netgear router(2nd wifi) with which I have had experience. Just as described. Very easy to install. And they have great support--Very easy to manage settings and update the software. It works and I got it cheap. Otherwise, meh. This is the router I'm using now. It's unobtrusive and it does its job, just like a home router is supposed to. It seems to work fine passing packets back and forth, and the range seems okay, although with it being located in the basement it probably could be a lot better. It handles a Mac laptop old enough for middle school pretty well despite the Powerbook's WiFi-B card. Perhaps most importantly, I got it for $20 at a flea market. This is not a router that will knock your socks off. The web interface is fine, but Netgear for some reason doesn't provide telnet access the way my old RP114 did (you can enable it, but it's difficult and I don't think the functionality is anywhere near as nice as the 114's menu-driven interface). It's not especially hackable either; there's four major hardware revs out there and OpenWRT doesn't seem to know what to do with any of them (they say they're working on it). On top of all that, unless you're willing to go end-to-end with Super-G gear and have an actual application for it (wireless multimedia/NAS, maybe, or a clustering system of the SETI@home ilk), Super-G is a waste of money, since it's nonstandard and not really supported out of the box on most laptops. 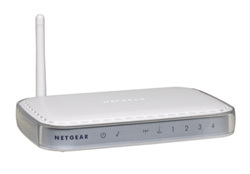 I owned a Netgear 624 router for a few years, and it had worked great. One day the DHCP function decided to stop working, and my network was dead. Since I didn't want to be bothered trying to upgrade the wireless devices I own to an N protocol, I decided the smartest thing to do would be to replace the old 624 with a new one. Made perfect sense, right? The new one is terrible. I didn't really pay attention to hardware and firmware revisions between the old router and the new one, but suffice it to say that I wish I could re-incarnate my old router. A few somewhat quantitative examples: Nothing else has changed but swapping a new router for an old one. Finding the network: Old Router: Rock solid- network was always listed under "View Available Wireless Networks"
New Router: Sometimes it isn't there. Sometimes it comes back by itself, sometimes you have to power cycle the router. Dropped connections: Old Router: Hardly ever-maybe once every couple months. New Router: Once every couple hours. There are a few more other bugs. Occasionally the wireless connection to my laptops will slow down, and only rebooting the laptop seems to clear the problem. Not sure why this should happen like this, but the problem started with the new router. The "attached devices" menu option in the router is unreliable. It often doesn't show devices which I know are connected, because I can address them. Not a big deal, but certainly something that should be implemented correctly. I also have one device (a dell all-in-one printer) that seems to work best with a fixed IP address. (Don't ask...this took a 1/2 hour with a very smart gentlemen in the Philippines to work out). The old router had no problem assigning this a fixed IP address. The setup screens on the new router are the same, and about 75% of the time, the router assigns the printer the desired address. The rest of the time, it gives it a random address. Netgear tech support was...well- not very supportive. After an hour on hold, I was connected. The gentlemen on the other end of the phone made no sense. Luckily a friend was visiting who is a native speaker of the language in question. After a minute he handed the phone back to me and said "that person makes no sense in any language". Score one for 3rd world tech support. I will probably unload this thing on Craig's list- who needs the hassles of Best Buy. The old router was a great piece of equipment, and I have a Netgear switch was has been a flawless performer. Not sure what I will replace this with- since Linksys and D-Link seem to have their own problems. I have had a problem with this for over a year (owned it a year in Jan)> It worked for a few days and hasnt ever since. I have spent wasted time with tech support from both netgear and verizon. Last night verizon tech called netgear and was told from India that support was not available without payment or going online...HAHAHA>>>CANT go online with it. Bought this router to replace a piece of junk Linksys WRT54G. The WRT54G, like every other Linksys I've ever had, needed to be rebooted constantly and had poor features and range.